The above is the trend for the tag NSA (Google and Technorati need to get the search term in the graphic if they want to make these things portable). I say limited trending as the link associated with the chart that is meant to take you to the full chart interface (as with their normal search) is broken. With the Wall Street Journal's redesign, we now have 'tag cloud' views of three different publication genres: blogs, boards and online news. It would be nice to believe that we could use these tag clouds to compare what is going on in either the respective media or the users of those media. However, the term 'tag cloud' has broken out of the constraints implied by the word 'tag'. Technorati's tag search tokenizes tags into individual 'words' (thus making it possible to search for the 'tag' the). I'm not sure if the cloud itself contains these pseudotags. The treatment of tags as plain words or strings means that the tags don't really share a common and distinct semantic space but are more like keywords. Note, however, that a search interface for tags (i.e. searching the space of tags, not the space of tagged posts) would be the proper place for this type of tag decomposition. 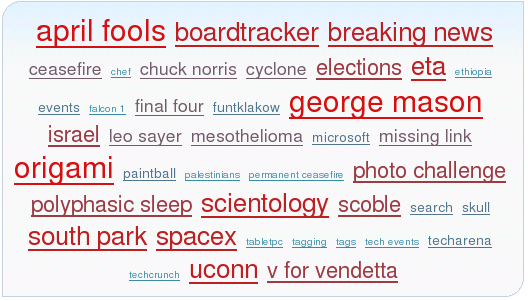 The BoardTraker tag cloud shows tags provided by users of the search engine. The tags are at the thread level. The Wall Street Journal's tags are not really tags, but search terms. Here the term 'tag cloud' has come to mean the form of the visualization, not the type of data being visualized. In some sense, this demonstrates the strength of the visualization, but further weakens the notion of tags and tagging. Which discussed some of the issues surrounding tags and the notion of folksonomies. WordWorks has an interesting deep dive on tag clouds. There are plenty of examples in the post of different approaches to tag clouds and their various merits. Interestingly, all of these examples are for reasonably well behaved tags (atomic symbols). I'd love to get an opinion on the nightmares of multi-word tags, morphology and so on. On a related note, due to the broken nature of tags, Technorati (and possibly other tag search services) have to tokenize the tags to index the tagged posts in blogs (actually, the don't have to, but they do). This means that you can search for the 'tag' the and get a result. Great: I think I really need to know what people are saying about the these days - is it an emergent tag I wonder? After all the debates about the value of a free, unconstrained tagging space, the fact that you can implicitly tag posts with contentless words says alot. By default, the blogs are presented in order of authority, which means highly-linked blogs appear first. 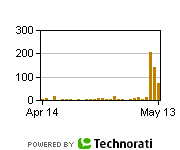 So each of these Blog Finder pages is like a mini Top 100 for any topic you can imagine. You can also sort each tag by how recently the blogs have updated, or alphabetical by title. This looks like a response to all the uber list complaints, and interesting in light of my earlier post on the opening in the blog space for just such a service as well as discussion on what tags really should be used for. I'm not convinced that ranking by tag authority is the right way to go for the ideal solution (a brief scan of some results suggest this is a light-weight solution), but getting something going in this area is something of a milestone.